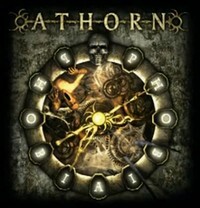 Athorn is a band from Hanover which was founded in 2008, but everybody in the band was active in various bands - like drummer Sören Becker and bassist Thomas Maiwald who both been part of neo-thrash band Cripper. It's the different musical background which is the basis for their sound. You'll find thrashy elements, reminiscences to bands like Iced Earth and Nevermore. The fivesome combine a heavy groove with fat riffs and harsh vocals. The opener Angel Of The Fall is a good example for the sound of Athorn. After Humanize The Demon - for which they did a video - they head into the title track with Phobia - Prologue, the title track Phobia start slowly and very melodic, becomes a mid-paced melodic power metal hymn. Again they change direction. Singer Carsten Frank's powerful clean vocals remind me of Andy B. Frank... At least some passages. From Beyond is a powerful modern metal tune with a progressive edge. And has a catchy refrain, a good choice to check out Athorn. The closer is called Schizophrenia, but if you expect schizoid piece of music then they will proof you wrong. At Schizophrenia they show all facets of their music and so I can just recommend to check it out! While the last Brainstorm album couldn't convince me completely, Phobia can. And I think Brainstorm fans who like some thrashy riffs and aren't afraid of harsh vocals, will dig Athorn's Phobia!